This one's nice enough, and she does make me think on what happy looks like... Meron palang mukha ang pagiging masaya?! 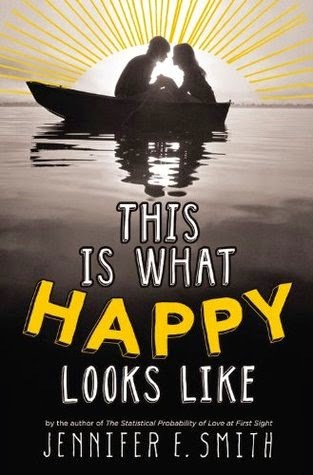 So Smith's book title has made happy which is seemingly so abstract into something more concrete. If happy has a face, what does it look like to you? When teenage movie star Graham Larkin accidentally sends small town girl Ellie O’Neill an email about his pet pig, the two seventeen-year-olds strike up a witty and unforgettable correspondence, discussing everything under the sun, except for their names or backgrounds. “It was exactly as he’d thought it would be, like the first time and the millionth time all at once, like being wide awake, like losing his balance. Only this time, it wasn’t just him; this time, they were losing their balance together. Sunrises over the harbor. Ice cream on a hot day. The sound of the waves down the street. The way my dog curls up next to me on the couch. Evening strolls. Great movies. Thunderstorms. A good cheeseburger. Fridays. Saturdays. Wednesdays, even. Sticking your toes in the water. Pajama pants. Flip-flops. Swimming. Poetry. The absence of smiley faces in an e-mail. Thoughts on Brittany Maynard's "Right-to-Die"